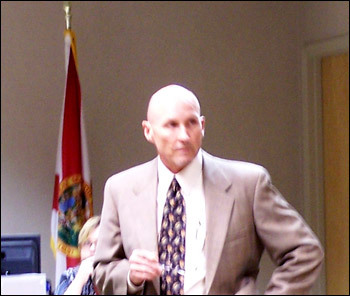 The Volusia County Bar Association's Family Law Section, chaired by Rice & Rose partner, Paul Rice, welcomed newly appointed Circuit Court Judge David B. Beck to the family law division at its meeting on September 20, 2011. Approximately 50 family law lawyers as well as various family law court personnel were in attendance to welcome the new judge. Judge Beck was recently appointed by Governor Rick Scott to fill the vacancy created by the retirement of former Judge Julianne Piggotte. Judge Beck was a county court judge in Volusia County for approximately ten years before his appointment to the circuit court. He will be presiding over family law cases on the east side of Volusia County at the Courthouse Annex in Daytona Beach, Florida.